Sundubu, or soft tofu that hasn’t been completely solidified, is enveloped in the unique aroma of beans. Comprised of 90 percent water, soft tofu can easily stuff any diner. It’s also a healthy food, rich with calcium and minerals. 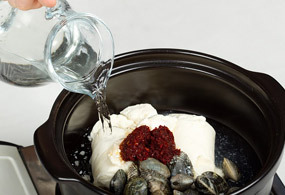 Soy bean curds consumed during the Joseon era were made by solidifying the liquid extracted the beans with sea water or limewater and pressing it all together hard. Therefore, unlike the tofu we enjoy these days, tofu in the olden days was actually rather hard. That’s why making soft tofu was a very rare technology in history as ancient documents record that only some professionals made soft soy bean curd. 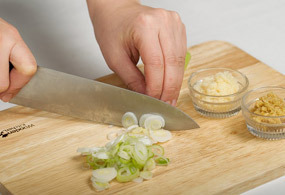 Chop the white part of a scallion stalk. Set aside the green part to be used for the seasoning sauce. Mince garlic and ginger. In a mid-sized pot, pour one cup of cooking oil and heat over high gas for 3-4 minutes to the point just before boiling. 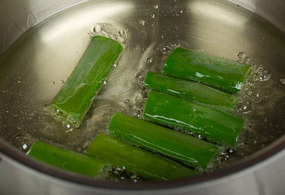 Add 10-cm-long scallion pieces; and keep boiling over low flame for about 5 minutes. Turn off the gas, take out the scallion, and set aside to cool for about 20 minutes. While cooling the oil, clean short-necked clams and oysters with salt water. 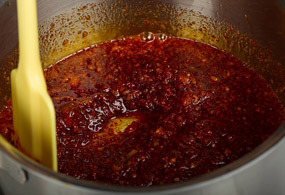 In the cooled oil, add soy bean paste, chili pepper powder, minced garlic, ginger and ground pepper and blend well for a smooth mix. In a heated pot, stir-fry the seasoning sauce for about 10 minutes over low flame. 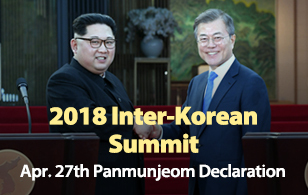 In an earthenware bowl place a lump of soft tofu, fresh short-necked clams, 1 tsp of salt, 2/3 tbsp of seasoning sauce, 1 cup of kelp water and simmer. When the contents come to a boil, add oysters, egg yolk, and chopped scallion pieces and cook for 2 more minutes. ☑ Ginger rids seafood and tofu of the fishy and any unpleasant smell. ☑ The amount of seasoning sauce in today’s recipe can make a stew serving two people four times. 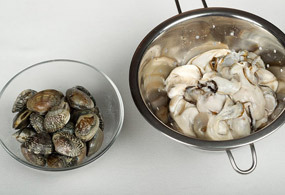 ☑ Wash short-necked clams in salt water by rubbing them and rinse well in clean water. Sprinkle salt over oysters and remove harmful substances and rinse them again in cold water. But take note not to wash them several times because the great fragrance of the oysters will be rinsed away. ☑ Adding soy bean paste to the seasoning sauce will render a very delicious soup. 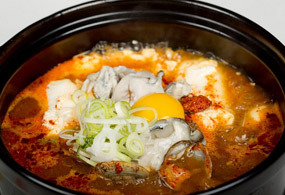 In particular, the fermented paste will enrich stew cooked with seafood. 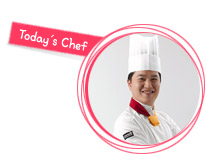 ☑ Be careful not to break the lump of soft tofu while boiling so that the final dish looks delicious. ☑ Add oysters, egg yolk and chopped scallion in the last step. Then simmer briefly, 1-2 more minutes.